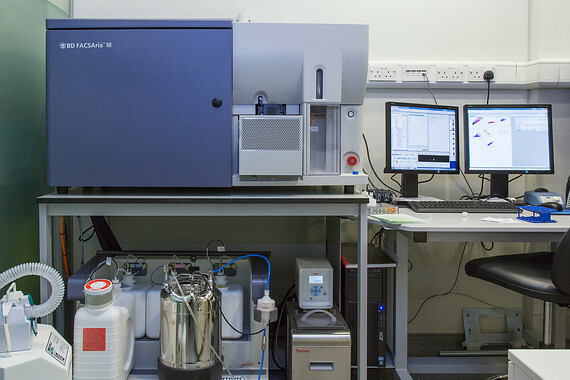 Flow Cytometry Core Facility at UCL GOS Institute of Child Health provides state of the art instrumentation and expertise for cell analysis and sorting. Only PPMS registered users have access to instruments and analysis computers. The facility has two types of insruments and two free of charge analysis computers. The instruments are either cell analysers or cell sorters. Users can directly book any cell analyser they trained on. Cell sorters are only operated and booked by facility's staff. Users can check the availibility of the cell sorters in the link below and call or send an email to facility's staff indicating the time they would like to book their sort. *must login with flowcytometryich@googlemail.com account - requires PW that is available at the facility. You can only see availability. Make sure to check that the antibody was validated to be used in flow cytometry (FCM). Please acknowledge use of the facility in all publications. Suggested text: Flow cytometry was performed at the UCL Great Ormond Street Institute of Child Health Flow Cytometry Core Facility, supported by the Great Ormond Street Children's Charity (GOSHCC), grant reference U09822 (October 2007), and UCL Capital Equipment Funding, School of Life and Medical Sciences (September 2012). Quite busy: Book a week in advance for convenient time. CytoFLEX, Array, Calibur, CyAn: Can be booked on the day. Can be booked on the day but you are advised to book 1 week in advance for a convenient time slot. You are advised to book at least 2 weeks in advance for a convenient time slot. FlowJo, FACSDiva, Kaluza, Summit: Can be booked on the day. Analysis computers are free of charge.